Fibreglass roofing is an eco friendly way to protect your home from the elements. 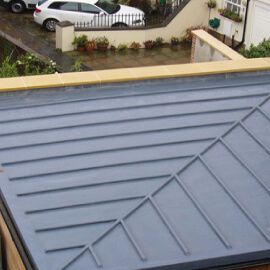 Fibreglass Roofing systems are also known as glass reinforced polyester (GRP) flat roofs. We specialise in Fibreglass Roofing which is carried out to the highest standards. This is the only true cost effective solution available. 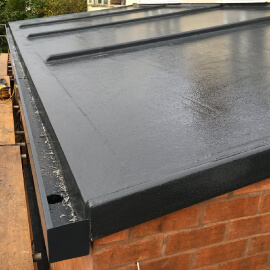 Whether your requirements are for domestic or commercial, we can provide high quality, guaranteed, weatherproof and maintenance free, flat roof repairs. Dunelm Roofing supply Fibre Glass Roofs, which provide a smooth, solid, laminated surface, with no joins, seams or welds whatsoever. Our high quality Fibreglass Roofing will cover your entire roof area, is maintenance free and tough enough to walk on or stand ladders for access for window cleaners. This is the only true cost effective, Fibre Glass Roofing solution around. Our guaranteed, weatherproof and maintenance free flat roof repairs are available throughout Boldon Colliery and surrounding areas.